The Easiest Meal Plan Ever! I’ve lost my meal planning motivation. I used to enjoy sitting down and surrounding myself with recipes to plan out our meals, but the past several years that train has lost its steam and has unfortunately, come to a grinding halt. I simply do not enjoy planning and cooking anymore. Perhaps its due to my husband losing a lot of weight and working hard to maintain that weight loss. Perhaps it is my own weight loss journey that has made meal planning no fun. Maybe it’s being a homeschool mom or mom of many that has me exhausted. Or maybe, just maybe, its a season…one I must ride out. 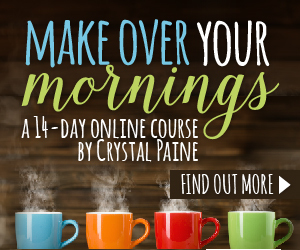 This past weekend, I finally finished the Make Over Your Mornings course. I am so glad it’s a lifetime membership! It about took me that long to finish it! In one of the sessions, she talks about coming up with simple solutions to lessen how many decisions I needed to make in the course of a day. Then, she mentioned breakfast…and the light bulb went off! Breakfast is not my thing. It’s probably due to the fact that my husband has never required me to make breakfast for him. For years, he didn’t even eat it, and since his weight loss, he has specific things he eats – none of which require me to cook. However, every morning, I have a multitude of children asking me what there is to eat for this first meal of the day, and I sort of just stare at them with this un-caffeinated blank look as I wait for the Keurig to warm up my brain. So, when Crystal Paine asked the question – what can you do to lessen the decision load – a simple breakfast solution was definitely first on the list! That’s when it occurred to me that I already had a solution at my fingertips – an ebook I had purchased several months back and never even opened – Kim Sorgious’ DIY Breakfast Station! I need to get back on Periscope and give an update on my test run, but suffice it to say, it has been a hit! Now that we are doing DIY Breakfast Station, the boxes of food are there waiting for the children every morning. Once they got the hang of it, no one needed to ask me what they could have for breakfast. It was truly one less decision I had to make – and that, my friends, is priceless! Get your copy of DIY Breakfast Station HERE! So, we now have our Breakfast plan in place, our Lunch plan in place, and the only thing left is the Dinner plan. This is where I chose to be semi-creative. I chose 5 meals that didn’t require much energy to put together, and I purchased those ingredients. I chose to go with only 5 because when you are struggling, it’s good to keep things as simple as possible and not go overboard with plans. I went shopping right after I made the above video and I purchased everything on the DIY Breakfast Station list, as well as the soup, salad, and sandwich fixin’s for lunch, and the items needed to make the 5 dinner meals. Every day this alarm goes off. It tells me to stop what I’m doing, no matter how important I think it is, and turn my attention toward feeding the family. It might seem like a silly little thing, but this reminder has been a lifesaver! It’s helped me stay focused, and not find myself scrambling last minute to get dinner on the table. This is just one more way I am simplifying the path so I can enjoy the journey more! Simple is good! I went with an annual meal plan a couple of years ago, and I’m so thankful for it! Each July I make a new one, and a master shopping list to follow. I don’t anticipate using it forever, but for this season of life, it works perfectly. Great advice on simplifying life! I am SO with you- I used to love meal planning because it felt like a creative outlet. But being in full homeschool mode with 3 boys (two of whom will eat anything, one who only likes burgers and apples) and frankly, meal planning is my most dreaded chore of the week! Thanks so much for these tips! The DIY breakfast station is awesome! We’ve been using it the last month or so. I am a big fan! I must have missed your lunch plan before. Heading over to check it out now. Maybe there will be so help for me in that arena. I really like this concept of DIY breakfast stations. I have question. Do the recipes that require reheating or cooking use the microwave? Want to plan for how the kids will cook or heat the hot breakfasts. Thank you. I have a weekly meal plan for breakfasts, lunches, dinners and snacks. I do the same plan each week, but the dinners are flexible. So I have one Soup dinner night, which could be any kind of soup, and one Crockpot dinner night which could include any meat I found on sale! I do the majority of my shopping once a month, especially for the breakfast, lunch and snack items. Then I just watch meat sales weekly and get the fresh stuff and anything we run out of. It has simplified my life tremendously and I don’t have to really think about anything! You may not believe this but JUST yesterday I went searching online and on your blog for ideas of how to meal plan. Have been feeling totally unprepared for dinners and it has often left me overwhelmed all day. A much needed post. Thank you! I LOVE knowing what I will be making for dinner before 5:00 and it has saved plenty of $$ on the emergency take out! Ok so it was 13 meals: 1. Spagetti with bread, 2. Breakfast burritos, 3. Unstuffed cabbage casserole, 4. Baked Potato Bar, 5. Country Style Biscuits/Gravy, 6. Creamy Pork Hunters Sauce & Noodles, 7. Lemon Garlic Chicken over rice, 8. Ham & Cheese Potato Soup, 9. Cheesy Chicken & Rice Enchiladas, 10. All In One Breakfast Casserole, 11. Homemade Pizza, 12. 15 Bean Soup & Bread, 13. Spagetti Pie! :) Oh! and…if you go to the Big Family Homestead page on you tube, they list out all the recipe ingredients for you! I would look over what I’ve cooked, past menus and such, use Pinterest and the THM cookbook (if that is what you’re still doing) and just rotate my menus. I hate meal planning too but I’ve kept the last several years worth of menus so I just pull that out, rotate that and add in an occasional dish I’ve seen on a blog or on Pinterest. rock pot!! Crock pot!! Crock pot!! Your best friend. I know of people who take a day a month and precook/brown meat, freeze it and pull it out later. With all them kids, put’em to work. Meal prep in a day, pull out of freezer for a month. you can crock pot some really good breakfasts or any meal at all. I am not as busy as I have been in times past but there are sooooo many more things I’d rather be doing than meal planning or cooking. It’s my least favorite household chore. One thing that helps me is theme nights. I learned about it on Lifeasmom.com. Right now I have Breakfast Monday, Taco Tuesday, Soupy Wednesday, Cassarole Thursday, Pizza Friday (Friday Night Fun Night), Old Faves Saturday, and Football Food Sunday. Having the categories really helps to make the decisions easier. I change up the categories with the seasons–or when football season is over! Hi Amy! More than once your post has been exactly what I needed to hear. Thank you for this. I am with you, I am so done with meal planning and could eat out every day. If only :) I am trying to motivate myself with different things and most of all trying to see a change in my thought life. My husband mentioned something a while ago…He talked about how each meal prep/meal is like a sacrifice. I need to check which book it was that he was quoting, because I need something spiritual to get me going. I just told my husband yesterday that I like cleaning but don’t like cooking at all. He was little sad to hear it, because he doesn’t really like cooking either :) Too bad kids need to eat :) I would like to prepare healthy meals, but today it was mainly carbs and protein…. Veggies tomorrow! Im going to go and set a dinner timer on my phone right now! We have a new baby in the house, and most days I blink and it is almost 7 o’clock and everyone is asking about dinner. I have a 5:00 alarm as well! That’s when the littles start to clean up their messes, I clear off the table (which is where we also do school) and I start dinner. It really has made our evenings so much easier! Honestly, I am in the same place. I recently ordered the new THM resources, and I am finding that through them I am seeing a better way to do this (the new books make WAY more sense!). I feel more excited about food again. It’s hard, though. My husband also lost a lot of weight using My Fitness Pal, and so he no longer eats the way he once did. That also took away my joy in cooking – cooking for the kids just isn’t the same ;). I feel like I can find my way back, but it is going to take some thinking outside the box, and until then, this will have to suffice. Here’s the thing – I DID NOT fully understand the plan from the original book. There was too much information in too many places for me to digest it all. You might be able to tell from my blog, I like things to be spelled out in simple terms! lol So, yes, for you it might not be a necessary purchase. For me, it was indeed! I do this exact same thing! I get carried away in the afternoon doing stuff and things lol, so my timer helps bring me back into those anchors of my day called meals and bedtime!